When the research was performed, all the authors were with the Physikalisch-Technische Bundesanstalt, Abbestrasse 2-12, 10587 Berlin, Germany. A. Liebert (adam.liebert@ptb.de) is on sabbatical from the Institute of Biocybernetics and Biomedical Engineering, Trojdena 4, 02-109 Warsaw, Poland. 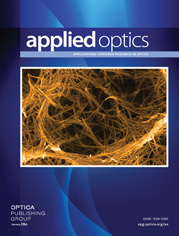 A novel method for the determination of the optical properties of tissue from time-domain measurements is presented. The data analysis is based on the evaluation of the first moment and the second centralized moment, i.e., the mean time of flight and the variance of the measured distribution of times of flight (DTOF) of photons injected by short (picosecond) laser pulses. Analytical expressions are derived for calculation of absorption and of reduced scattering coefficients from these moments by application of diffusion theory for infinite and semi-infinite homogeneous media. The proposed method was tested on experimental data obtained with phantoms, and results for absorption and reduced scattering coefficients obtained by the proposed method are compared with those obtained by fitting of the same data with analytical solutions of the diffusion equation. Furthermore, the accuracy of the moment analysis was investigated for a range of integration limits of the DTOF. The moment analysis may serve as a comparatively fast method for evaluating optical properties with sufficient accuracy and can be used, e.g., for on-line monitoring of optical properties of biological tissue. a Mean time of flight m 1; variance V.
b c is the speed of light in the medium, r sd = |r d -r s | is the source-detector separation, and D is the diffusion coefficient. d See also Ref. 9.